Bena is a traditional village that has become one of must-visited destination when you are on the island of Flores. During your stay at Bena village, the atmosphere of stone ages will remain, where traditional speaks louder than modernity, where nature embraces the whole being around the tradition. The visitors will also embrace the warm welcome by the inhabitants, with beautiful red stained smile, for almost the inhabitants chewing betel nut. 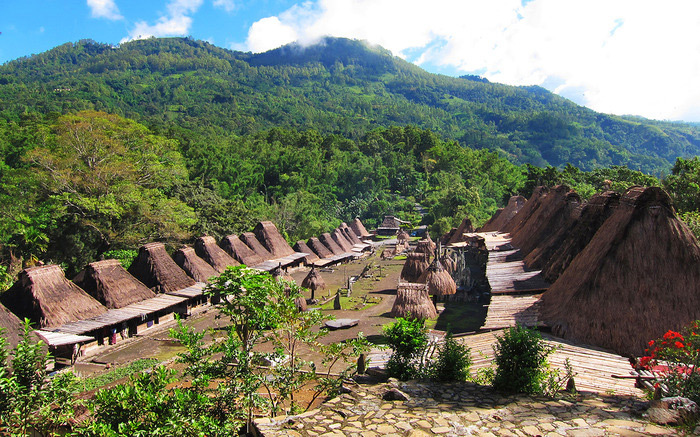 This village is one of living proofs for the magnificent tribes in Indonesia. Bena village is one of the megalithic villages that located in Ngada, East Nusa Tenggara. It precisely located in the Tiwuriwu Village, District Aimere, about 19 km south Bajawa. The village is situated on a hilltop with a view of the mountain Inerie. Its presence at the bottom of the mountain is a hallmark of the old society as a devotee of the mountain of the gods. The life in Bena Village is maintained along the Stone Age culture that has not changed since 1,200 years ago. Here, there are nine tribes inhabiting 45 housing units, namely: Dizi tribes, Dizi Azi tribe, Wahto tribe, Deru Lalulewa tribe, Deru Solamae tribe, Ngada Tribe, Khopa tribe, and Ago tribe. The distinguishing between one tribe to another tribe is on their level, which contain of 9 levels. Each of the parts is in one level altitude. Bena tribe's own house is in the middle, because Bena tribe is considered as the oldest tribe and founder of the village because it is also named after Bena. The tribes in Bena live as cultivators with verdant gardens that growing on the sides of the canyons that surround the village. To communicate, they use Nga'dha language. Moreover, almost all the residents of Kampung Bena embraced Catholicism but still running the ancestral beliefs including custom and tradition. Currently, there are 326 people in 120 families that live in Bena Village. Bena Village is kind of virgin in technology, for never deal with any technology in advances. The architecture is very simple that only one gate for entry and exit. Bena architectural building is not only a mere for occupancy, but has a deep meaning and function containing local wisdom and still relevant in today's society applied in the management of the built environment that are environmentally friendly. The values are can be seen that people do not exploit the environment, it can be seen by the their settlement land, that still in an appropriate original contour hilly ground. Bena village is also resembles the shape of a boat; the boat is considered, by megalithic confidence, linked to a vehicle for the spirit that led to his residence.